With Mother’s Day approaching, it is fun to have children make crafts that they can proudly give to their Mama’s. This is a quick and easy project your child can make with very few supplies. When I was in college and graduate school, I was a recreation director and did a children’s art program every Saturday. We had lots of construction paper, tissue paper, glue and other basic supplies which I needed to find new uses for each week because I had the same neighborhood children hungry for art each weekend. One thing the children enjoyed making was construction paper and tissue paper flowers. Here is one variety that children who know how to use scissors can make and toddlers can help with the process. 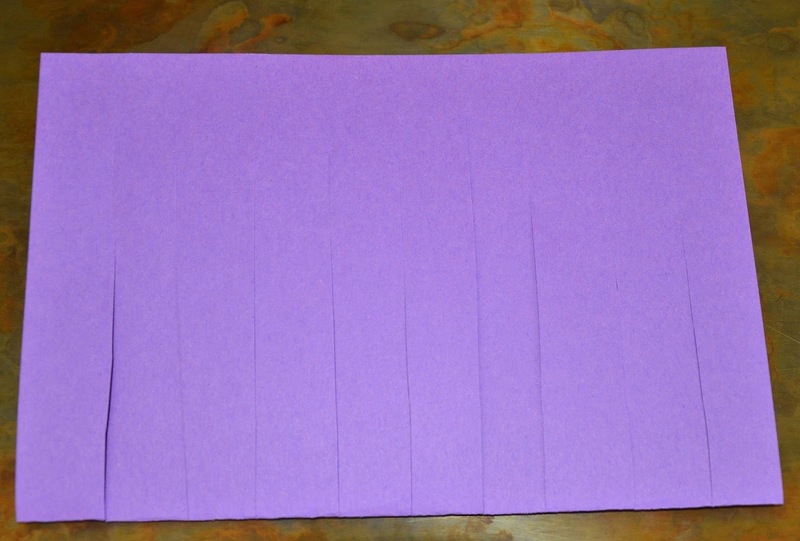 Take one sheet of construction paper and fold it in half horizontally (in a gentle way so that you do not have too many creases). Have your child (or help your toddler) cut strips all the way across without cutting all the way through the paper as pictured. If you have younger children who are newer to scissors, you may wish to draw lines on the paper to show them where to cut. Do this with two sheets. Have your child reverse the fold by taking one uncut end and meeting it up with the other uncut end so that the petals of the flower are open (rather than flat). Do this with both sheets. Then take both sheets and lay them on top of one another (uncut ends together) so that there are two rows of petals. Have your child (or help your toddler) to roll the uncut ends of the paper to make a flower shape (as shown in the first picture.) Use a stapler to hold the flower together. Next, if you would like a sturdier stem, have your child fashion one out of construction paper (or attach flower to a wooden dowel or branch). Staple or tape to the flower to the base and then wrap the tissue paper around it and attach with the stapler. Younger children can help push the stapler to help staple. If desired, have your child tear the tissue paper to shape a leaf and twist it onto the stem. Then, staple it down. 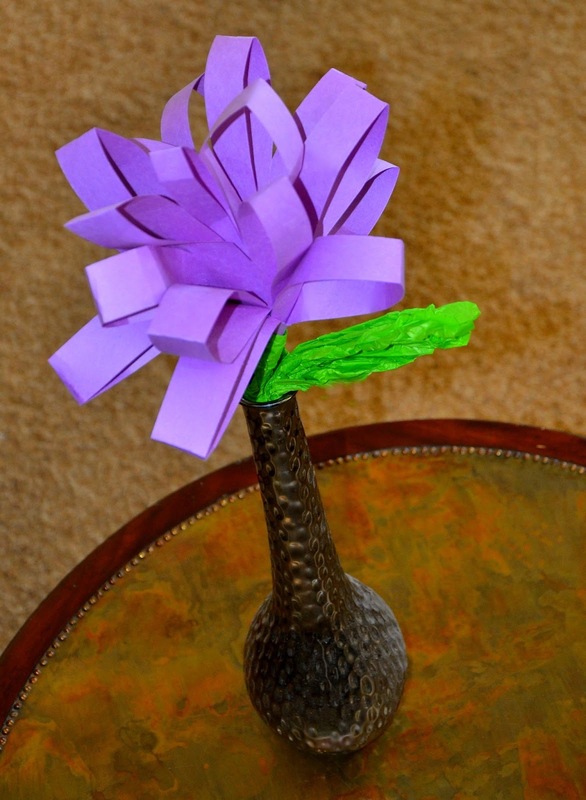 If a sturdy stem is not needed, skip this step and simply shape the stem and leaf out of tissue paper. The Sugar Snaps love this step of squeezing and crunching the tissue paper. We recycled green tissue paper from a gift bag. Toddlers (with some assistance) or older children can also squeeze and arrange the petals of the flower. Place in a vase if desired, or simply hand it to Mama with a note or card. Our kids are never bored by art projects. They love to crinkle paper, glue and paint. They are also practicing with scissors. Have you done any projects for Mother’s Day this year? For the Mamas out there, what do you have planned? I hope you get lots of R & R and a little pampering this year. Oh that came out so pretty! My girls would have fun making these. Thanks for sharing on We Made That!